In 1985, nobody could have predicted that in October 21, 2015 there would be a device called an iPad that, when connected to the internet, would contain all the sports scores in all of recorded history. So time traveler Marty McFly was destined to discover a paperback called Grays Sports Almanac, that had all the printed scores from 1950-2000, instead. However, it's currently June 26, 2013, and somehow they both now exist thanks to this cool new Back To The Future Grays Sports Almanac iPad Case that has mysteriously appeared. Obviously, a point in the space-time continuum has been changed. 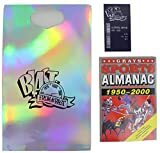 Yep, this replica cover of the infamous sports almanac from Back to the Future 2 wraps around your iPad to protect it, sort of like wrapping a dust jacket of Oh LaLa over an almanac at an Enchantment Under the Sea dance. Unfortunately, you still need a time-traveling DeLorean to make any use of any of this on bets placed in the past, but only if wi-fi is available as well. So until then, enjoy this blast from the past.